Located at the Southern end of Bogota, Paloquemao is THE one stop ‘superstore’ for small restaurant owners’ weekly visits and individuals’ monthly shopping. It’s a huge and hustling market that’s as big as a football stadium offering literally EVERYTHING: meat, veggies, diary etc. Bogotanos have a love and hate relationship with Paloquemao. Driven by a class-conscious psyche, the citydwellers’ choice of restaurants, grocers and means of transport depend hugely on how their social status can be exemplified (a real nice example for Bourdieu if he was still alive). So you’ll get the bunch who loathes the sound of Paloquemao, calling it dirty, low class and chaotic, and the other bunch who passionately advocates the benefits of doing the weekly shopping there. Paloquemao is all about super early morning shopping for the freshest possible produce. Bogotanos rise early, so 7am is considered ‘late’. Most bulk buyers start to arrive at 5am, and the ‘late morning’, 7am onwards, is retailer shoppers’ time. Allegedly, Saturday morning is your best bet as the market stocks up on Friday night. How do you get through the humongous market that’s sure to give you a headache afterwards? Do it the Colombian way. Finish your shoping with a heavy breakfast (or the other way round depending on how brave you can be) of caldo de costilla – beef rib clear bouillon, a coffee and an almojabana or pan de bono from ‘Barra Café’, one of the best in the city. The café is found at the Northern entrance of the fruits venders. People say that Paloquemao is much cheaper than your regular grocer or supermarket. After some careful analysis I’d say the price differentials are not worth the hassle of going once a week, quite the contrary to the general consensus. If your regular grocer is Carulla, the supermarket that enjoys a monopoly status and therefore tends to reap everyone off, then yes, Paloquemao is MUCH MUCH cheaper. 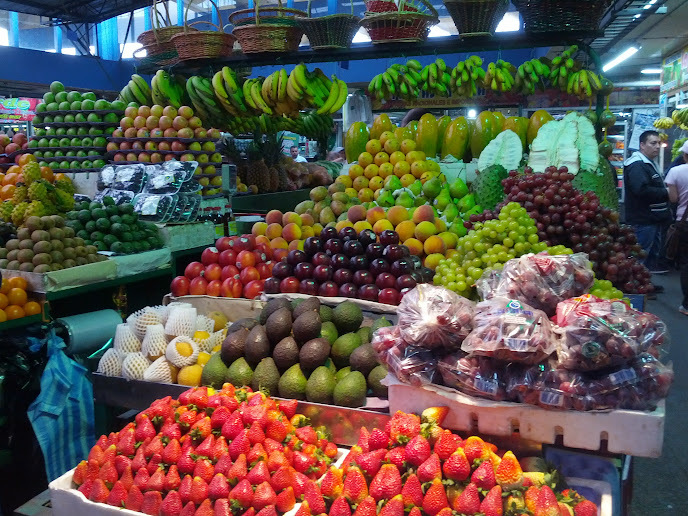 But if you usually go to Surtifruver, the big green grocer chain in Bogota, then the fruits and vegetables from Paloquemao aren’t necessarily cheaper or fresher. Since Colombia seems to have no buffer stock system, fruits and vegetables during harvest are dirt cheap. So in Colombia it’s really worth practicing the notion of buying from local sources and consuming products in season, because imports are disproportionately expensive and fruits/veggies outside their seasons are expensive and hard to get. By expensive we’re talking about 100% more than the prices of harvest periods. My hypothesis is that Paloquemao venders are individual small businesses who probably can’t enjoy the benefit of bulk purchase to offer special discounts during big harvest times. So you may find Surtifruver cheaper than Paloquemao at times. That said, meat from Paloquemao is really cheaper, and you will feel the difference especially if you buy in large quantity. One thing that’s definitely true about Paloquemao’s good value is the flowers. I’ve heard that Ecuadorians drive overnight across the continent, arriving at the crack of dawn to stock up some fresh high quality flowers from Paloquemao. In spite of the contention, Paloquemao is worth seeing at least once for the pre-capitalist consumption experience. There, you’ll talk directly with the business owners, such as a bit of a bonding session with your potato man; you’ll go to a different shop for every type of produce, like choosing a clay piggy bank from all shapes and sizes at the knick knack shop. My conclusion is that since shops at Paloquemao specialise, all the waiting and queueing at all the stores you need for your shopping is far too inefficient for what its worth (imagine the total queueing time at 10 separate places for your shopping (that includes paying a visit to the egg shop, the fishmonger, the butcher, the chicken shop, the green grocer, the dry-goods, the potato shop, the diary shop, the herbs specialist.. etc..).